HB 363 stipulated that schools only be allowed to teach an abstinence-only curriculum to prevent communicable diseases and that teachers be prohibited from talking about contraceptives to students. HB 363 also stated that schools would be able to opt out of any discussion of sexual education completely. Many parents have been outspoken in opposition to this bill. Current law requires parents to opt-in their children to sexual education curriculum by providing signed permission forms stating the level of education approved by the parent. As it stands 97% of parents opt their children in the current sexual education curriculum leaving 3% who oppose it. A study conducted recently by Brigham Young University reported that 58% of Utah voters agree that contraceptives should be taught in the school, while 29% disagree. HB363 would have done away with the current system and banned teaching contraceptives altogether. On Friday, Governor Gary Herbert vetoed House Bill 363. The bill would have restricted what schools could teach children in terms of sexual education. It would have allowed districts to choose to remove it entirely from the curriculum and limiting parental choice. 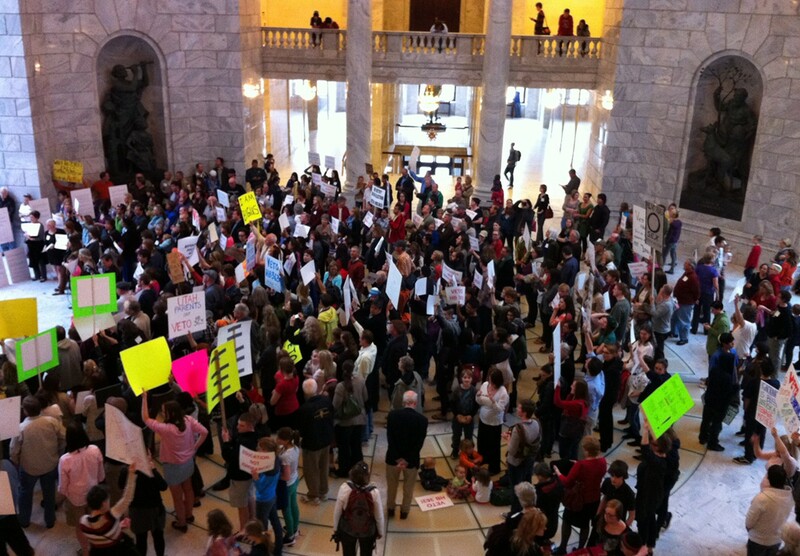 Parents and groups had expressed concern over the bill since its recent passing in the Utah legislature. The bill drew sharp criticism from parents and educators, which sparked a social media campaign uniting people together across party lines to speak out against the bill. Hundreds of educators, parents, teens and children were all in attendance at the rally held at the state capitol on March 13 in opposition of the bill. According to SignOn.org, more than 40,000 people signed an online petition to encourage Governor Herbert to veto the bill. Proponents of the bill reject the petition on grounds that anyone can sign it multiple times, be they from Utah or not. Those who began the petition manually edited the names, throwing out entries of those outside of Utah, and those with obviously false names. The remaining total was about 32,000 names. Governor Herbert said that he would not be swayed by public opinion but by policy. Though in a recent interview with KUER’s Dan Bammes, the governor’s spokesperson, Allyson Isom said that the governor has received many “individually and uniquely crafted” letters and e-mails by parents and educators asking the governor to veto the bill. In a Pizza and Politics event held recently at Salt Lake Community College, Tim Sheehan, SLCC vice president of institutional advancement, spoke to the audience about participating in the political process by contacting legislators. “I just vetoed #HB363. I cannot sign a bill that deprives parents of their choice,” —Tweet from Governor Herbert. The veto of HB 363 is a good example of people sharing their stories, writing the governor and getting involved in the political process. Parents were passionate about this bill and shared that with the governor their concerns in personal writing rather than form letters. Social media seemed to be a big factor in getting the word out about this bill, encouraging people to attend the rally and in writing the governor. It was even through social media that the governor announced that he had vetoed the bill. “I just vetoed #HB363. I cannot sign a bill that deprives parents of their choice,” tweeted Governor Herbert.